Is everything fair in love, war and politics? Or should parties in power be more respectful towards the ideals of democracy? After a while, these shameless efforts send an immoral signal to the next generation of politicians. Will no one ever resign gracefully? Sometimes watching contemporary history unfold, especially in India, one forgets that this kind of tug of war, unseemly scenes in Parliament, the shocking denial of open corruption, deals being struck behind closed doors, and making almost a mockery of democratic ideals is something most other countries, all mature democracies now, have already witnessed, and survived. It’s a moot question whether the CBI Director was right in attending the meeting. I do not see any fundamental flaw here. What was objectionable was his failure to tell the minister — in the most polite words he could command — that being an SC-monitored probe, the CBI could not share any information. These are testing times for the CBI. The apex court observations on its handling of Coalgate confirm what has always been suspected by the public: the CBI is a handmaiden of the ruling party. Its Director has been candid enough to admit — a day after the court’s lashing — that it is true. This endorsement possibly also refers to the most colourful description ever by the court (“caged parrot”) on what the CBI’s compulsions are. “Time is not far when humans will explore space to live in,” says A Sivathanu Pillai, a distinguished space scientist. Pillai, who was honoured with Padma Bhushan last week, discovered planets like Kepler22h and Gliesen667c have the same temperature as the Earth. “Man can move to these planets for living, and return to the Earth on a holiday,” he says. These planets are at a distance of 122 light years. Sometimes watching contemporary history unfold, especially in India, one forgets that this kind of tug of war, unseemly scenes in Parliament, the shocking denial of open corruption, deals being struck behind closed doors, and making almost a mockery of democratic ideals is something most other countries, all mature democracies now, have already witnessed, and survived. But the difference is that now the elected representatives, in many of those countries, have grown up and understood their responsibilities (especially in the European nations, barring a few such as Italy) and so has the electorate. The latter now are much more careful about re-electing those who are known to be corrupt, but in India, we still seem to believe that being ‘elected’ by the people somehow is a license to break all the rules. Of course one should not defend the indefensible and one always hopes that whichever government is in power, it will take the right decision and fulfil some of our expectations. But, alas, the temptation to stay in power appears overwhelming — a sense of entitlement emerges accompanied by desperate, almost ridiculous, efforts to keep the other guys out. But should it be so? Is everything fair in love, war and politics? Or should parties in power be more respectful towards the ideals of democracy because after a while these shameless efforts simply send a very immoral signal to the next generation of politicians. Will no one ever resign gracefully, and will people cling on to power till it reaches an almost embarrassing finale? Just because other parties might have been equally corrupt, does it give a justification for everyone to turn a blind eye? These are difficult questions, and sometimes one has to understand that perhaps this is a very painful period that we are passing through in India, and unless we, the electorate, make a decisive change, things might continue like this. And one wishes that our cinema, books, literature were more representative and realistic about what has been happening to our politics, and was able to give us a behind-the-scenes view. Often, that reflection can give us a fresh insight. One of the joys of living in London is that the arts here have no shyness in examining contemporary history. Just recently I watched a wonderful play This House by James Graham at the National Theatre. The play was about politics in the UK between 1974 and 79 when Edward Heath had been ousted, and the Labour Party had a wafer-thin majority. Interestingly, alongside me, in the audience, were members of the Labour Party who had actually lived through that period. It was fascinating to view the events unfolding on stage — from the perspective of those who still remembered the pain of being a government with a majority of just three. The government’s precarious existence made it completely dependent on a recalcitrant bunch of smaller parties referred rather impolitely as the “odds and sods”. This House showed all too grimly the Machiavellian scheming going on in the office of the party Whips , and no matter whether people were ill, sick or even dying, the ruling Labour Party had to ensure each member was present for each crucial vote. And the rest of the time was spent by a highly insecure government in often striking unholy deals with the “odds and sods”, a precursor, perhaps, of things to come in present-day coalition politics. But the play was equally scathing about the behaviour of the Conservatives who were in the Opposition, and rather ferociously so, leading often to chaotic scenes in the UK Parliament, including the swinging of a mace by Michael Hestletine! The Tories had smelt the weakness of the government — and were sometimes vicious in their adversarial stance — reminding the Labour Party that the distance between the two benches in Parliament is (even now) the length of two drawn swords. Thus, the Tories would dream up schemes of how to win and woo the “odds and sods”, and very often the Liberal Democrats, among others, became the bargaining chips. This was a very volatile scenario, and even though some good Bills were passed, the Tories eventually managed to stitch up an alliance which led to the passing of a vote of no confidence. But perhaps all this scheming and plotting, especially by the ruling Labour Party, took its toll and the country lurched to the right, decisively. Ultimately, Labour lost the election to Margaret Thatcher, a grocer’s daughter who represented a new stability. Is this, then, what it will mean for us in India today? Will the electorate realise their blunder of delivering a fractured mandate and give a healthy majority to the next government? I wish we could sit with Members of Parliament (as I did in London) and watch a theatrical representation of their political lives on stage —without anyone threatening to burn the theatre down! Kishwar Desai’s novel The Sea of Innocence has just been published. Too many restrictions have been clamped on the organisation that it has no personality of its own. The occasional noises it makes are of no consequence as except for a handful of unfortunate top civil servants and ministers, the rest of the large numbers hauled up by the CBI are all lowly bureaucrats who have no protection from the infamous “single directive” that requires permission from the government to proceed with even a preliminary enquiry (PE) against the higher echelons, which include ministers. 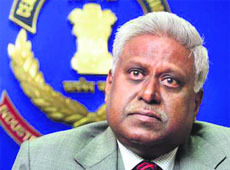 CBI Director Ranjit Sinha (above) and ousted Law Minister Ashwani Kumar. If ever there was glaring inequality before the law, it is this obnoxious and most untenable fetter on the CBI investigators. The original sin was committed by the NDA government in 2003 when it revived the rule through the CVC Act. If a civil servant is accused of malfeasance that benefits the minister, it is the latter who has to tell the CBI whether it can proceed against his subordinate (sometimes the secretary to the minister). Catch a minister agreeing to a CBI inquiry against one of his faithfuls who had helped him in a shady deal. This is the travesty of the situation, and yet you expect the CBI to go after those in high places! Nothing can be more ludicrous. Coming to the latest episode, all the evidence till now proves beyond doubt that it was the Law Minister who called for the meeting. The principal law officers (AG and ASG) were also roped in. It’s a moot question whether the Director CBI (DCBI) was right in attending it. I do not see any fundamental flaw here. What was objectionable was his failure to tell the minister — in the most polite words he could command — that being an SC-monitored investigation, the CBI could not share any information. This was a grave failure that the court has rightly come down heavily upon. The DCBI was not guilty of dishonesty, but definitely of pusillanimity. It is a different matter whether his predecessors would have done any better. Any value judgment is not germane to the issue on hand. I am equally clear that opinion on the guilt or otherwise of the minister and his law officers, as also of the two Joint Secretaries, one each from the PMO and the Coal Ministry, is within the province of the court and not of any outsider like me. Suffice it to say none of these individuals emerge with honour from this episode which should be recognised as a watershed in the history of the CBI. These gentlemen may have to explain themselves if no odium should attach to them. The basic question raised in all this is whether it is possible or expedient to define the limits of governmental oversight of the CBI. The SC did not mince matters during its hearing on May 8. It was categorical that the government had no right to interfere with a CBI investigation, implying therefore that what the Law Minister did was totally untenable. Calling for a meeting solely to snoop on the CBI and telling it what should go and what should not in the status report to the SC was impropriety to the core. I would go much further. My interpretation of the court’s fiat is that this embargo against meddling would apply to all of CBI investigations, whether court monitored or not. This is the law of the land in the form of the procedure for investigation laid down by the Criminal Procedure Code. It is not only the CBI, but all other investigative agencies, including those in the state police, also get this autonomy. It is an entirely different matter that this freedom is hardly respected by the executive in the states. Police subordination to Chief Ministers and their minions is the order of the day, and nobody dare raise this issue in public debate. This is why many police investigations in the states are a joke, especially when a ruling party member is suspected of illegal conduct and needs to be probed. The apex court wants to be told before the next hearing how the government plans to confer greater independence on the CBI, possibly by means of a new law. This is no doubt a difficult task, but not an impossible one. 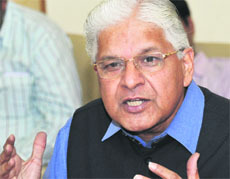 The strange fact — not many are aware — is that the CBI still derives its authority from the Delhi Special Police Establishment Act 1946, complemented by the Criminal Procedure Code 1973 and the Prevention of Corruption Act 1988, with the latter two legislations empowering other enforcement agencies like the regular police as well. In my view, the most sensible thing to do is to frame an exclusive Act for the CBI. Many a draft for such a law languish in the North Block without receiving any attention. This is because many in the government are comfortable with an emasculated CBI. I hope the SC will indicate that a special CBI Act alone will be acceptable to it. In the new dispensation, I would opt for a CBI that receives its infrastructure support from the CVC or a Lok Pal, if and when it comes into existence. It would be supervised by the courts in investigation work, a task that they are already doing in major cases. A carefully chosen director will ensure that in all other cases the CBI sticks to the law in registering and disposing them of. When taken to court, any inadequacies in the CBI Director-supervised cases will stand more than a fair chance of being highlighted by the judge concerned, even if not brought to court notice by the accused party. This arrangement may appear fuzzy now, but could evolve into a workable arrangement in future. There is a need for a process of consultation with legal experts before the draft of a new CBI Act is put up before Parliament. The next Chandrayaan mission in 2014 would explore the material on the moon, he says. “It has material like helium which can be mined. It will become the hub in the future for launching vehicles and mining,” Pillai says. 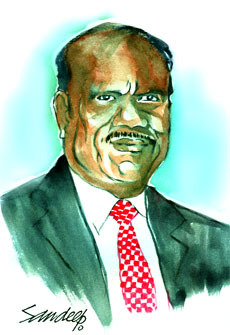 Known as the “Father of BrahMos Aerospace”, Pillai is the chief controller of research development at the Defence Research and Development Organisation, and chief executive officer and managing director of BrahMos Aerospace Private Limited. He has conceived and provided leadership in design, development, production and marketing. Having worked along some of India’s greatest visionaries like Dr Vikram Sarabhai and Dr APJ Abdul Kalam, Pillai has been at the core of missile research since 1991. He has made significant contribution in the development of Agni, Prithvi, Nag and Akash missiles. He has been honoured with several awards, including Padma Shri and Vikram Sarabhai Research Award. Asked why BrahMos became a benchmark in international cooperation, he says after the Gulf War, the Ministry of Defence realised the importance of cruise missiles. India decided to go for a weapon with supersonic speed. “The key to future war is speed. A supersonic missile needs a highly capable engine to reach the desired speed. That is why we focused on solid propellant technology. We were looking for a country that had the right technology. “We are very experienced with guidance system. We have our own functional navigation systems and excellent experience in onboard computers through the Prithvi and Agni programmes. Our friends at NPO Machinostroyenia were working with us as consultants. Russia and its companies were facing financial crunch after the collapse of the USSR. The roots of our cooperation led to a fruitful arrangement. One brought its achievements and funding for R&D and the other technologies for a supersonic engine,” he explains. “It was decided we would develop the supersonic missile in India making use of the Russian technology. We realised it would take five to seven years for the transfer of technology. Therefore, we thought it better to do things in parallel; work on the propulsion system in an approach that involves the engine directly. If we went shopping for such an engine, we would find restrictions for its use. This is a high-guarded technology. So, we found a way to work together in a joint venture configuration. The name for this cooperation was derived from Brahmaputra and Moskva — the two big rivers of our respective countries. The missile is now in service,” he says.